New Month Means New Snack of the Month! Welcome Peanut Butter & Co. Allow me to introduce you to the new snack of the month! Peanut Butter & Co. offers a variety of peanut butter products that are used to prepare some pretty scrumptious recipes. Check out their website here and drool as you scroll through their recipes! For now, we’ll leave you with one that really caught our eye. In large mixing bowl combine the flour, baking powder, and salt. In another mixing bowl combine the Bestie Almond & Cashew butter and salted butter, then microwave for 10 – 15 seconds until softened. Whisk the eggs, sugar, and vanilla into the butter mixture until smooth. In alternating doses slowly add the butter mixture and the milk to the dry ingredients until the batter takes shape – If there are some small lumps, that’s okay. Stir the blueberries into the batter. Heat a large skillet or flat griddle over a medium flame, then amply coat with cooking spray. Using a measuring cup, pour 1/3 cup of batter in the center of the hot pan/griddle, then gently spread out into a circle. Cook until bubbles appear on the surface, then flip and cook for 1-2 minutes more until golden. Repeat until all batter has been used. 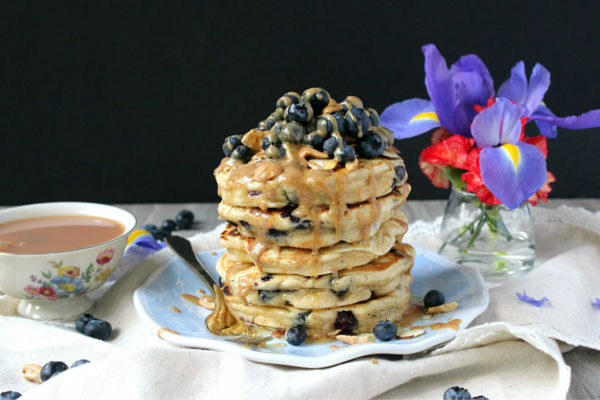 When ready, serve pancakes in stacks of 2 or 3 with drizzled Bestie Almond & Cashew butter, maple syrup, more blueberries, and crushed almonds/cashews, if desired.